It was, for Scott and Zelda, their honeymoon. Having just gotten married and after being kicked out of some of New York city's finest hotels, they were, for the first time, in their very own place, albeit for only five months. It was a time that Scott Fitzgerald called "the happiest year since I was eighteen. "He had, after all, just achieved success with his first novel, This Side of Paradise, and was suddenly awash with money. Historian Richard Webb grew up in Westport a few doors down the street from where the Fitzgeralds had lived some forty years earlier. Fascinated with the Fitzgeralds, when Webb learned that author Barbara Probst Solomon, who grew up across the river from the F.E. Lewis estate, proposed in the New Yorker that Westport was the real setting for Fitzgerald's Great Gatsby, he was stirred to actively researching her claim. Boats Against the Current tells the real story behind the famous novel and its tragic hero, debunking the long-held belief that the book was solely inspired by the Fitzgerald's time in Great Neck, across the Sound in Long Island, and lays out enough information about the fascinating Mr. Lewis that it is difficult not to believe that author Webb has located the true inspiration for one of the most captivating and iconic characters in American literature, the great Gatsby himself. Illustrated with a fantastic array of never-before-seen photos from the Lewis family, as well as the scrapbooks of the Fitzgeralds, period newspaper clippings, and a myriad of compelling stories about Scott, Zelda and their fantastically wealthy neighbor. 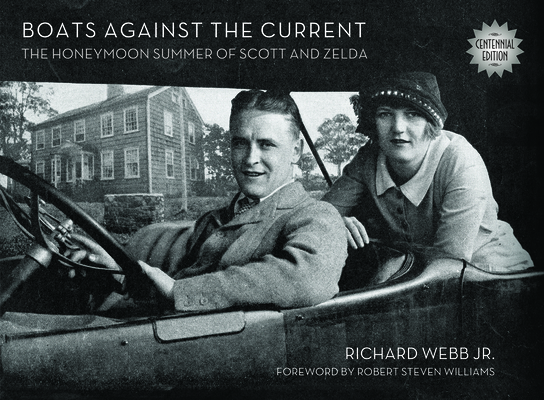 A companion book to the documentary Gatsby in Connecticut: The Untold Story, Boats Against the Current also recounts Webb's own journey of making the film with fellow Westporter and filmmaker, Robert Steven Williams. The Great Gatsby may be one of America's essential novels. Boats Against the Current is an essential document for anyone who has read the book and wondered at the fantastical world whose story it tells. Richard "Deej" Webb Jr., is an author, an award winning educator, and a documentary filmmaker. A graduate of Vanderbilt University, he has taught history for twenty four years at both the high school and college levels. A featured presenter in the Connecticut Public Broadcasting Prohibition documentary Connecticut Goes Dry, Webb is also co-creator and co-producer with Robert Williams of a documentary film about the Fitzgeralds in Connecticut, which is a companion to this book. He has been a resident of the Westport, Connecticut area since 1967. He lives happily in an historic home with his wife Deborah, and their dogs, Zelda and Daisy. Foreword by Robert Steven Williams, a Harvard Business School Graduate, music industry consultant and film-maker who lives in Westport, Connecticut. Williams and Webb have collaborated on a film about Fitzgerald in Westport that will air on public television in 2018.